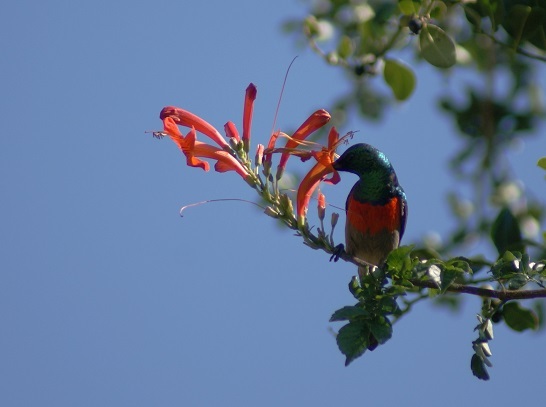 At this time of the year, when the bitingly cold weather sets in, aloes become a magnet for sunbirds. 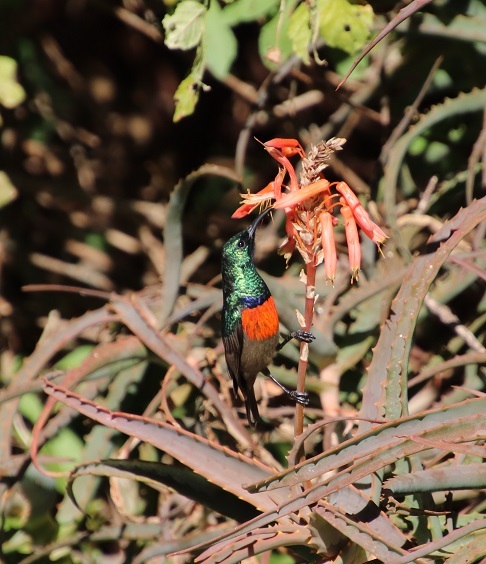 Here a Greater Double-collared Sunbird (Cinnyris afer) shows off his best side before getting down to the business of extracting nectar from this aloe flowerhead. This pose is the best for showing off his fine livery. 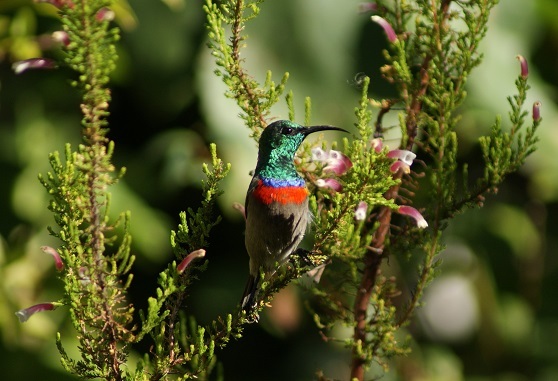 By now, feeling a little camera-shy, he turns his back on us – the glorious metallic sheen shines in the weak sunlight. 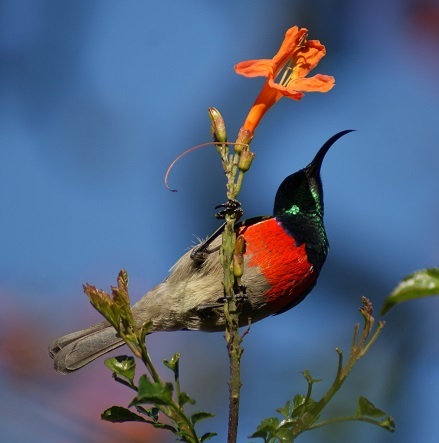 The Southern Double-collared Sunbird has a shorter and more slender beak than the Greater Double-collared Sunbird – an aspect that is not always easily discernible in the field. 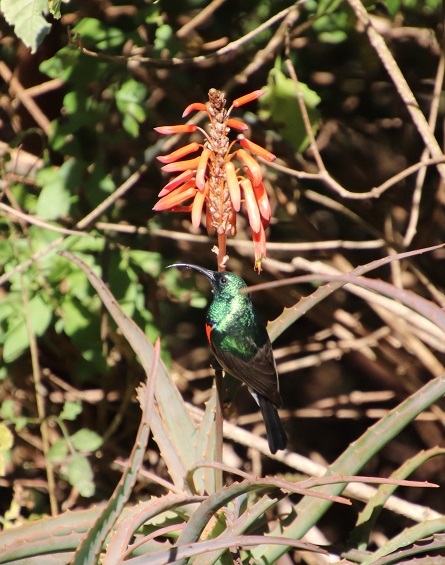 For comparison, here is a Greater Double-collared Sunbird – a year-round resident in our garden. 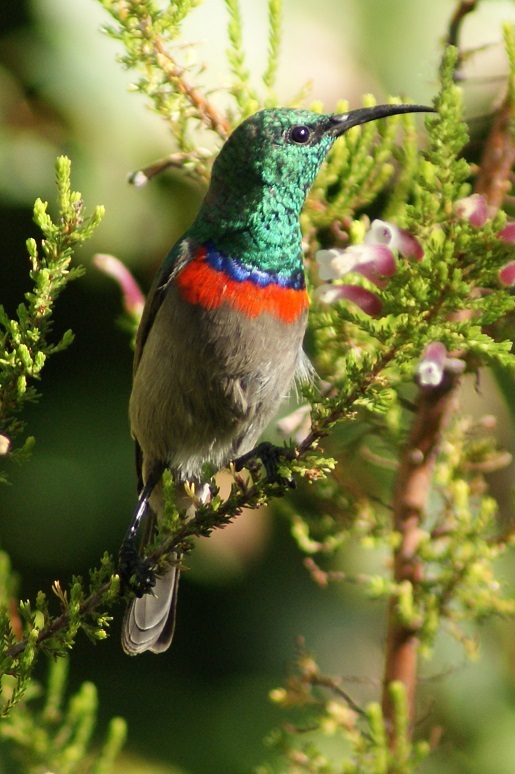 The photographs of its lesser cousin were all taken in Cape Town. 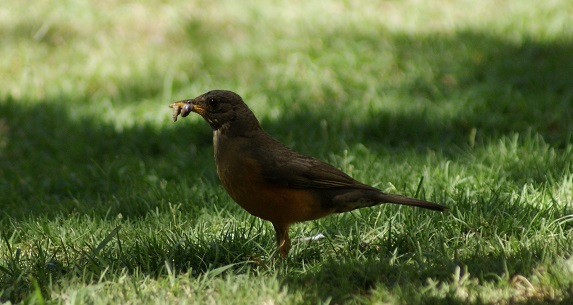 May has been a quiet birding month in our garden. The tall trees block out the rising sun and leave the lawn in shade until nearly lunch time now. 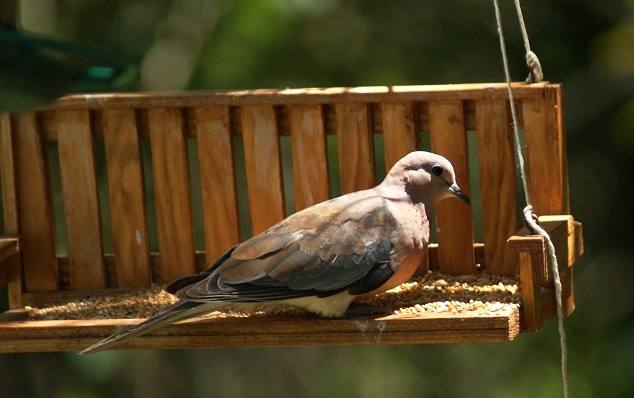 The regular flock of Laughing Doves gather in the top of the Erythrina caffra and the Cape Chestnut, catching the warming rays of the sun; only coming down to feed on the seed I have put out once the day has warmed up somewhat – that seems counter-intuitive to me, but they must have their reason for doing so. 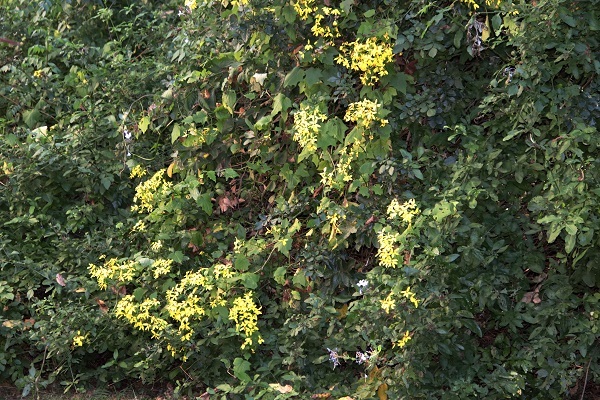 Village Weavers, now in their non-breeding plumage, tend to only visit the garden in the afternoons – appearing to be more interested in what the flowers of the Cape Honeysuckle have to offer than the seeds still lying un-pecked at on the lawn. Perhaps they have found a sunnier source of food elsewhere to satisfy their morning hunger. 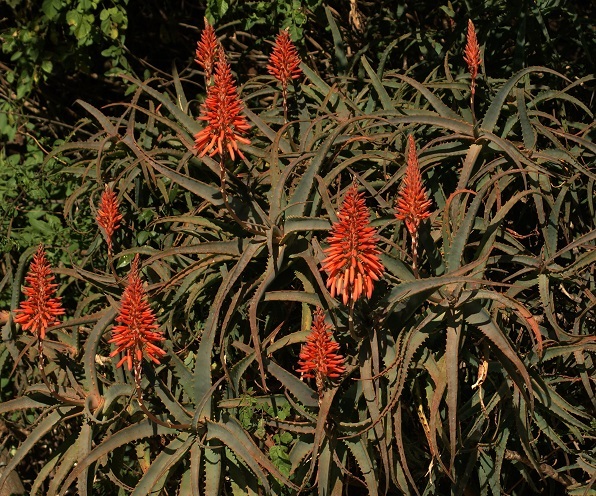 The aloes are in bloom though – and what a wonderful show they make. 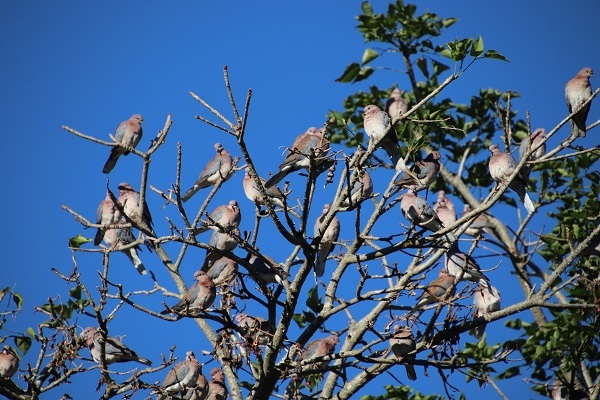 Some African Green Pigeons make us aware of their presence in the fig tree now and then, even though there is nothing to eat there at this time of the year. 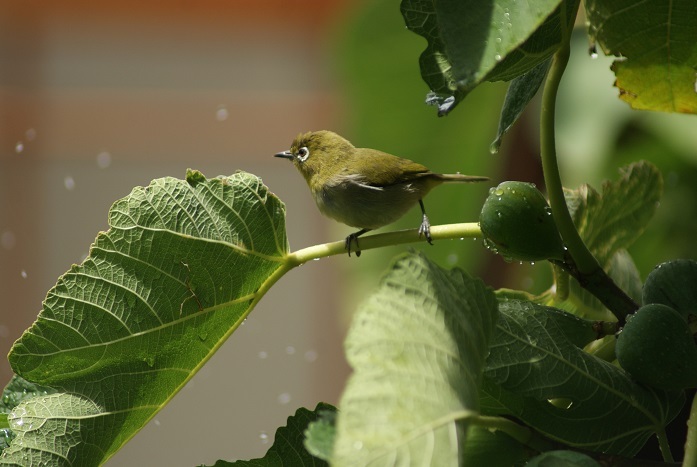 I have always been rather puzzled where these birds move to once the fig tree is bare. I happened to be on the campus of a school at the bottom of the hill late yesterday afternoon when I counted over twenty African Green Pigeons coming to roost in the oak trees growing there! 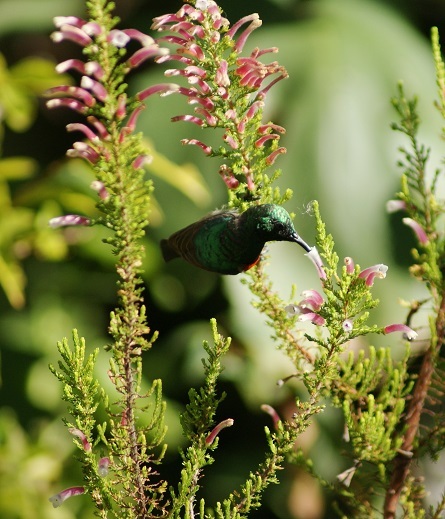 What has been exciting is the regular appearance of at least one Knysna Lourie – sometimes two – that moves effortlessly through our treed garden. 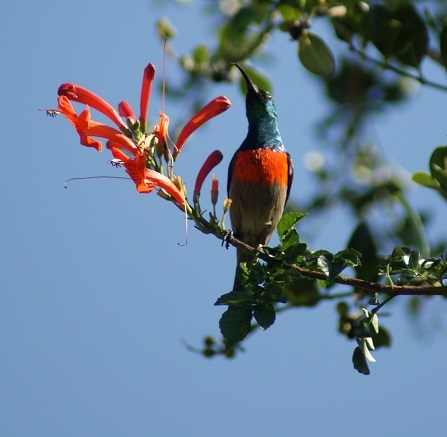 We have become used to some of its variety of calls that alert us to its presence and I watched in awe this morning as it dropped down to drink copiously from the bird bath situated below my study window. 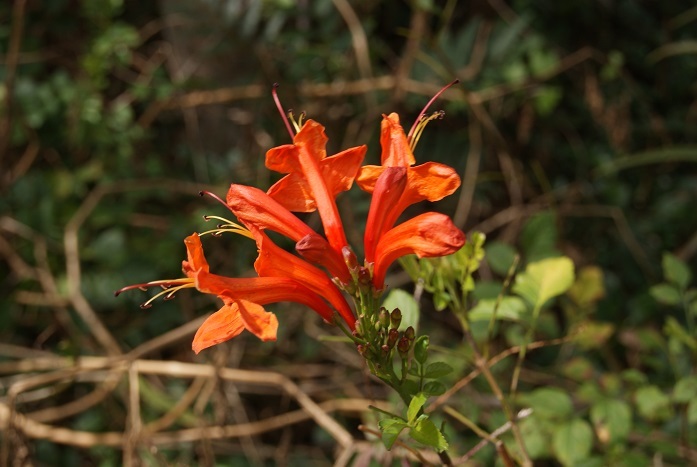 Commonly known as Cape Honeysuckle and formerly named Tecomaria capensis, this plant was recommended to us by a nursery as an ornamental screen for our garden in a newly established suburb in Pietermaritzburg. 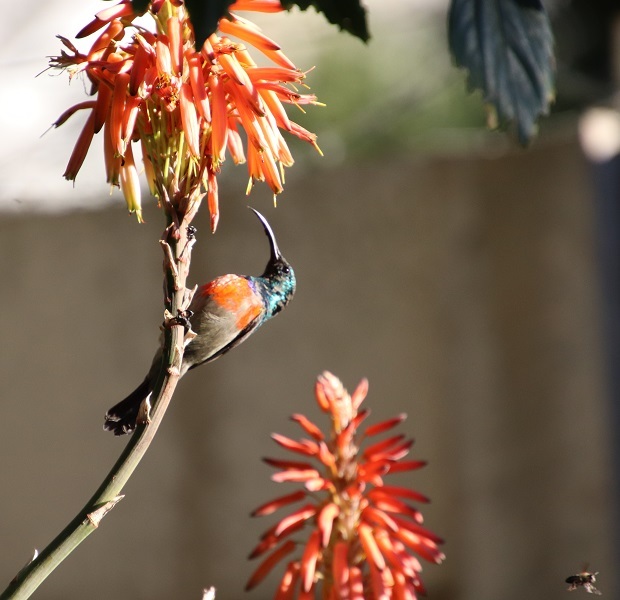 Years later, we purchased some plants at considerable expense at a nursery in Lichtenburg for our fledging garden in Mafikeng – and nurtured it. 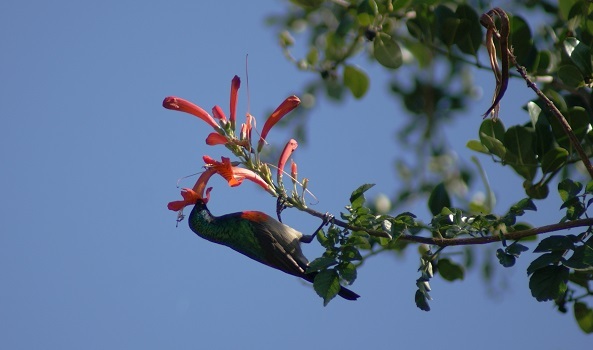 Imagine our surprise to find it indigenous to this part of the Eastern Cape, where we now live. 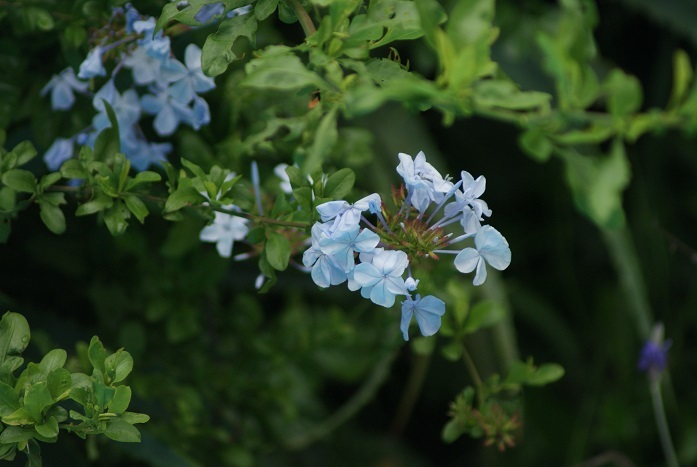 It grows rampantly in our garden: wherever a bit of its stem touches the ground it forms new roots and another shoot of vigorous growth clambers through the trees or weaves it way through the undergrowth. 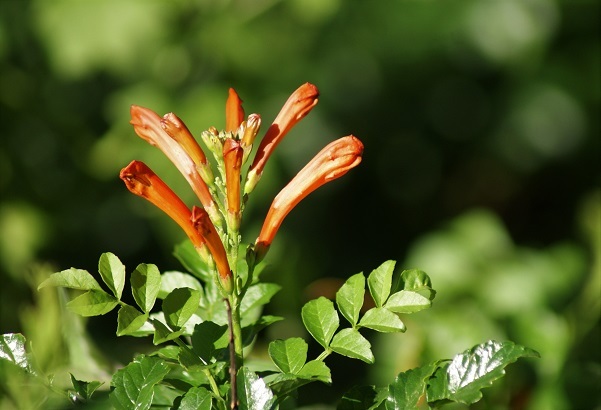 Over years it forms a hard woody stem that is difficult to cut. I prune it abundantly, yet never stem the tide. This makes it sound like a monster. It is far from that. 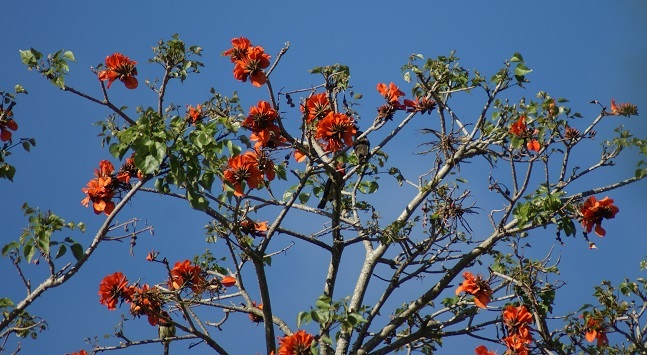 The flowers of the Tecoma capensis provide bright colouring during the change of season from warm to cold (we do not have clearly defined seasons here) and attract a variety of birds such as the Greater Double-collared Sunbird, Amethyst Sunbird, Cape white-eyes, Black-eyed Bulbuls, and Bar-throated Apalis. 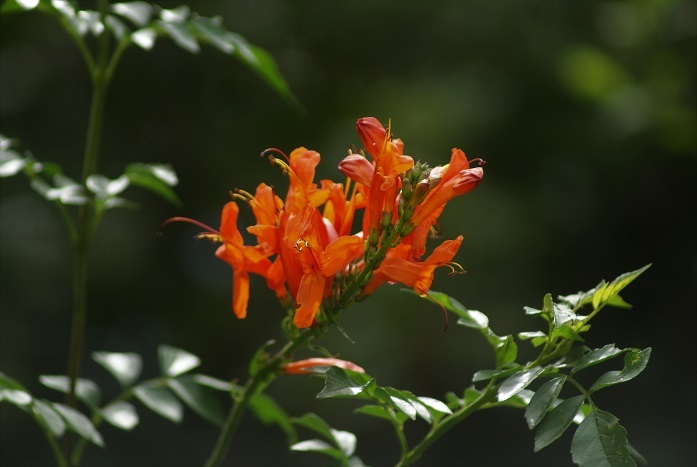 The tubular flowers also attract bees and butterflies. I was away for a good part of February so I blame my absence rather than the weather or the season for my relatively short bird list. 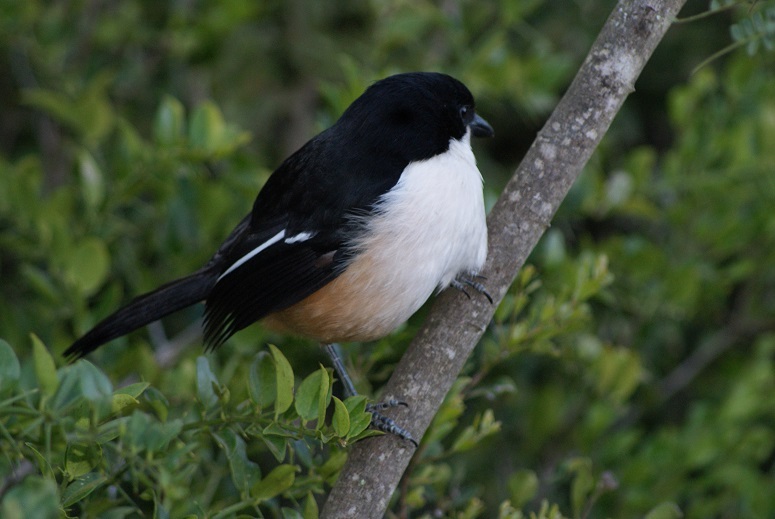 The Boubou (Laniarius ferrugineus) is usually fairly secretive and rather solitary in our garden – except when courting. The synchronised duets of courting pairs are beautiful to listen to. I feel fairly privileged whenever I see one skulking about in the undergrowth and very privileged if it deigns to inspect the offerings on the feeding tray to peck at the fruit. 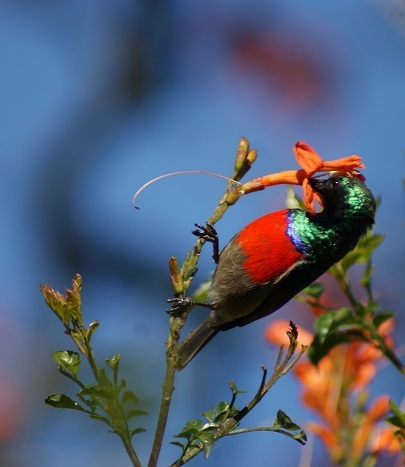 They mainly eat earthworms, insects and snails. 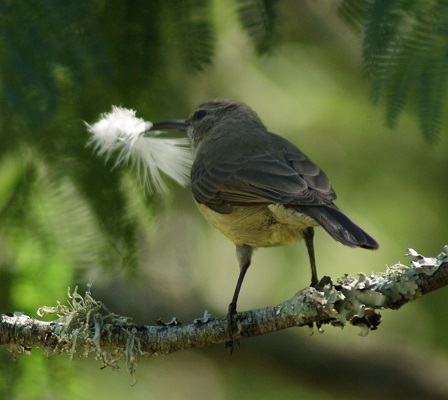 According to the Roberts Bird Guide they also eat mice – please Boubou, won’t you gobble up the rat that regards the feeding tray as its private banquet? 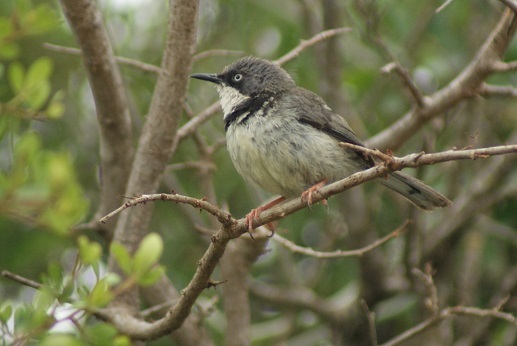 While on the subject of food: I have mentioned Fork-tailed Drongos diving down to catch hapless caterpillars exposed during my gardening activities, stealing food from weavers on the wing, featured images of them drinking from the nectar feeder, and voiced my suspicion that they may have raided – and broken – the nest of the Lesser-striped Swallows last season. 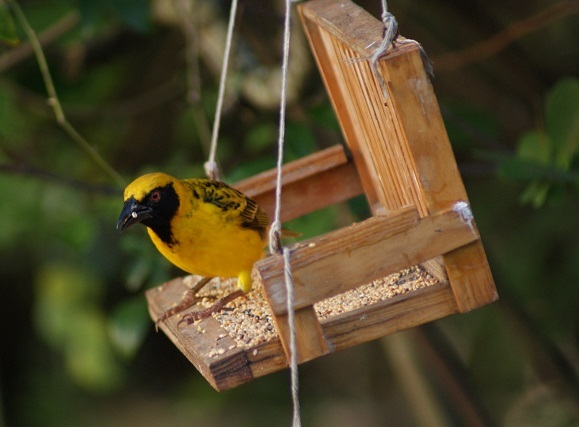 While they mostly appear to be insect eaters, small birds and nectar have also been recorded. It wasn’t until this month that I witnessed a Fork-tailed Drongo eating a bird. 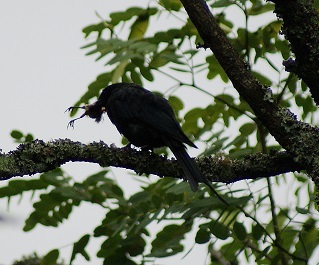 This is not a good photograph yet I include it as a record of a Fork-tailed Drongo eating a Cape White-eye. 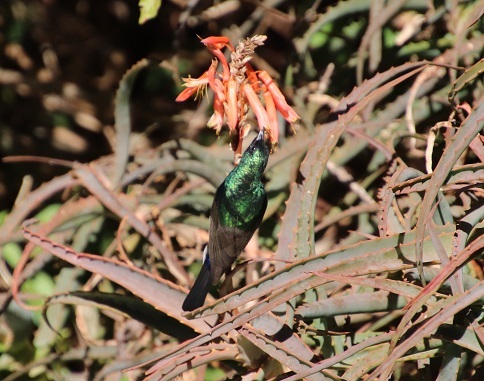 I also observed a female Greater Double-collared Sunbird collecting feathers with which to line her nest hidden in the back garden.